On this page are excerpts from the dozens of letters and commendations received by HDSCS regarding its performance in emergencies, standbys and drills. The Laguna Firestorm and Whittier earthquake are examples of Core Team responses. HDSCS Core team members activated an on-air net and deployed themselves automatically to their assigned hospitals without waiting for official callout from a community or government agency. This rapid response was a key factor in providing the highest level of service. "I just don't know where to begin to say thank you for the wonderful job done by you and your team during the 'hour of our need' this week. The fire situation in Laguna began to escalate, Orange County EMS activated the disaster plan and, as could be expected, our land line phone circuits were in overload. During that crucial first hour of stepping up our hospital's level of preparedness, our HEAR/ReddiNet* was off-line; we were not receiving any information about what was happening at the facilities around us. "Our ham operator Heiko arrived, set up and was our life line to the medical community around us. Heiko, his wife Patty, and the operators who followed were wonderful. I am not sure what we would have done without them and you, doing the seemingly impossible, including putting us in communication with staff and facilities outside Orange County. Please let everyone know how much we appreciate the caring and tireless work they did for us during this most recent emergency." *HEAR and ReddiNet® are commercial VHF voice and digital Internet/satellite inter-hospital communications systems provided by Healthcare Association of Southern California and maintained by the Communications Department of the County of Orange. "On behalf of our entire hospital staff, I want to thank you and your group for your outstanding support to Mission Hospital and Childrens Hospital at Mission last Wednesday night, when fires were raging through South Orange County. "From the beginning, your assistance was superb. Anticipating our need for supplemental communications, you dispatched volunteer radio operators before we even asked. Throughout the night, your crew conscientiously kept us up to date on news from the county and other hospitals. As a result, we felt more confident in our decisions and the completeness of our contingency plans. "Despite closed roads and gridlock traffic, your team came through. Again, please tell your men and women thank you very much. We feel very fortunate to have had the support of your fine group." "This letter is sent in the spirit of a belated thank you for your generous support of Martin Luther Hospital during the October 1st earthquake. 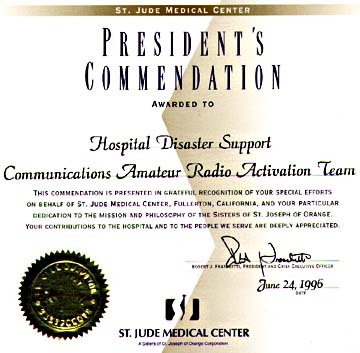 We have had, in the past, ham radio operators participate in county-wide disaster drills. However, that participation was prearranged with designated times and dates. It is comforting to know that in the event of a real disaster, the same level of support and participation is provided. However belated, we extend our sincerest thanks for your thoughtful support." When telephone cables are accidentally severed, switchboard components fail or communications become disrupted for other reasons in hospitals, ham operators were activated using the Call-up system. Each hospital had its own list of nearby HDSCS members on call-out status during working and non-working hours, plus a unique beeper activation code. The first HDSCS member reached immediately orchestrated a complete response as required. Hospitals were given instructions on how to activate hams even if the switchboard had completely failed and/or all telephone lines were cut. "Please accept my sincere and deeply felt thanks for assisting us in our recent internal disaster with the power outage. Your volunteers went above and beyond in their efforts to assist our team by providing volunteer help with communications. I can't even begin to tell you how much this meant to all the people who were involved. There were many, many positive comments and I know your assistance was greatly appreciated. "There were probably many other things the volunteers would have preferred doing that evening. It is wonderful to know that they recognize the importance of community service as well as patient and employee safety." "On behalf of the Administration and staff of St. Jude Hospital and Rehabilitation Center, I want to thank you for your assistance during the external telephone outage on February 3. "As you are aware, many of the messages handled by you and the volunteer Amateur Radio Operators were of a critical nature. Dedication shown by this Hospital Disaster Support Group is most impressive. It is through friends such as you that our emergency preparedness and disaster planning is successful. Your dedication is deeply appreciated." "This is in regards to the Amateur Radio operators assistance on June 29. The operators came twice, once in the morning when we lost our outbound dialing due to a Pacific Bell programming error and again in the evening of the same day as a scheduled request. Also a special thanks goes to the two coordinators who dispatched the call. "The operators who responded set up command very quickly and were ready to support our facility in every way ... They took control of the situation, planned their positions and dispatched themselves to the needed locations in the hospital. We greatly appreciate the tremendous service to the community provided by your group , please thank the operators who responded to both situations for their outstanding performance." "I want to express our gratitude and appreciation for your support during our communication system failures on February 27 and 28. Prior to these problems we felt that you and your organization might possibly be of some assistance during a phone problem. Based on our experience, it is obvious that your support is a key in our ability to recover from such a situation. "Additionally, I would like to comment you for your professional approach which made it quite easy for us to make use of your services. Your calm supportive approach greatly contributed to our response. "Thank you again. It is comforting to know that you and your colleagues can and will support us should the need recur." "We are deeply grateful for your prompt response to our gas line rupture today. It is reassuring to know that your able assistance is near at hand. It was very fortunate that the incident was limited. One medical office building had be evacuated for more than two hours and both CHOC and St. Joseph Hospitals could have been impacted if things had gotten worse. An explosion at the site of the leak would have destroyed the Pacific Bell cable feed to the campus, not to mention the potential that such an event could have in causing serious injury and disruption. "I wonder how many people are aware of the commitment that your volunteers have made in providing communications support to the medical community. I know that we at St. Joseph Hospital appreciate the efforts that HDSCS put forth in helping us to protect our staff and patients. "The good Lord blessed us with a favorable outcome. Even so, with your support, I believe we would have been ready for whatever twist that the incident had in store for us. Please keep up the remarkable work that you do!" When communications facilities within an Orange County hospital had to be taken down for major repair or upgrade, HDSCS members were available to provide temporary back-up. Besides providing preparedness for emergencies that may occur during the work, the event provided training and hospital familiarity for the hams. Many of these events were scheduled for the "wee hours." "I would like to take this opportunity to thank HDSCS volunteers for the support you provided us during the integration and installation of our new phone system. You all went above and beyond your expertise and provided us with the knowledge and equipment needed to safely complete this project. "We appreciate and thank you for your proficiency during this operation." "A very special thank you for your time during a telephone switch upgrade at Childrens Hospital of Orange County. It's nice to know we have people like you to assist and stand by during this type of an operation. "Thank you for coordinating the ham operators for our telephone upgrade. You and HDSCS were very effective during a stressful time. I am looking forward to the next telephone outage/upgrade, disaster or emergency, because I know I can count on the ham operators to help us. Thank you again for all your support." "On behalf of all of us, we would like to extend our deep appreciation to all of the ham operators who volunteered their time last weekend during our scheduled power outage. Knowing that the ham operators were on site and ready to step in should we have needed them in an emergency situation was most reassuring and appreciated. "It was a pleasure to meet them, they are a fine group of individuals and we are grateful for their participation." HDSCS participated in three major county-wide hospital/paramedic drills each year plus numerous drills at individual hospitals. This gave hospital personnel an opportunity to see ham radio in action and understand how ham radio communications can best be utilized. It also gives valuable training to the ham operators and acquaints them with the facilities they serve. "On behalf of the Disaster preparedness Committee at St. Jude Medical Center, please accept our sincere appreciation for your continued support as a partner in emergency preparedness." "On behalf of Anaheim Memorial Medial Center, we would like to thank your wonderful volunteers of the hospital Disaster Communications group for their ongoing dedication and expertise. We realize many of the ham operators work full-time and take time off work to participate with us during the various county mass casualty exercises, in addition to the regular training that takes place with the group. This demonstrates your ongoing commitment and professionalism. "Those of us who are familiar with disaster planning realize that your group is going to be invaluable during a true disaster scenario, and may be the only link the hospital has to outside resources. In addition, your availability during any type of internal communications problem at our hospital is commendable. 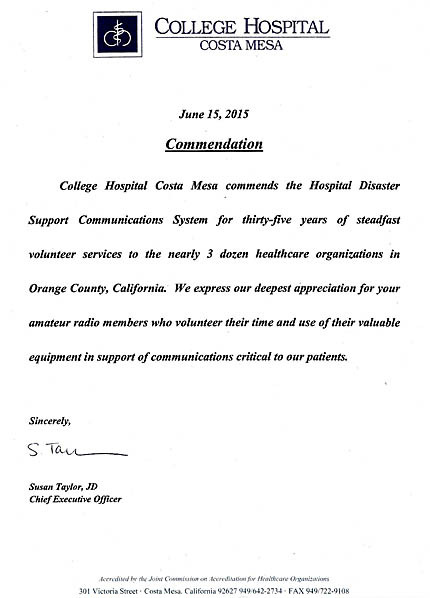 "Again, we wanted to let you know we appreciate the Hospital Disaster Communications group. Your planning and willingness to help us help your community in time of communication problems or a disaster is truly appreciated. Keep up the good work!" HDSCS stood ready to serve all medical-related agencies in the county, including ambulance companies, nursing homes and the Orange County Emergency Medical Services Agency. "I would like to take this opportunity to express my appreciation, and that of my company's employees, for the help and assistance you and your group gave to us during our recent and unfortunate communication [area telephone outage] problem. As you may already know, they said it couldn't happen, and now they say it will never happen again. "On that day, without phone service available, we were still able to contact and be contacted by local hospitals. At least two calls for ambulance service were received with your help ... I will endeavor to pass on my praises to any and all that I can." "All the folks involved with HDSCS are a vital link in the response chain. Each exercise makes this point more evident to all of us involved. 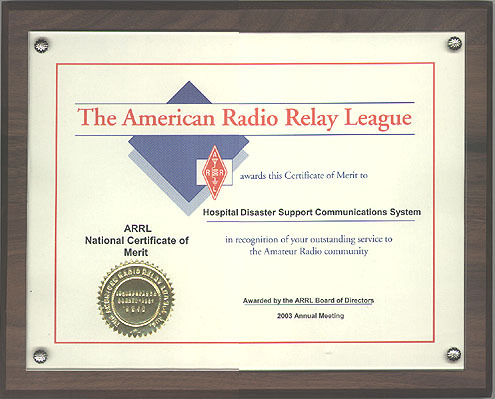 The achievement of the community's medical disaster mitigation goals are directly associated to the participation of Amateur Radio operators. As a result, Orange County continues to be one of the better prepared areas in the state in terms of disaster readiness ... You have our admiration and gratitude." "Congratulations on another successful year. HDSCS is a solid mainstay of Orange County's medical and health disaster response system. 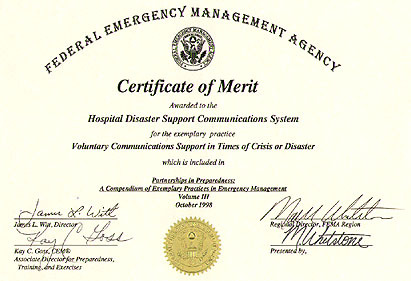 Your team has been the topic of many conversations about the critical communication needs during a disaster. Thank you for your commitment to service. The dedication, professionalism and experience that is demonstrated by each of the HDSCS team members brings great comfort to the hospitals, community and local EMS Agency you serve. As the Regional Medical and Health Disaster Specialist for OES Mutual Aid Region I and a resident of Orange County, it gives me great comfort to know that your team is there to keep the coordinated communications flowing. Keep up the great work!"